The Emergency Quota Act, also known as the Emergency Immigration Act of 1921, the Immigration Restriction Act of 1921, the Per Centum Law, and the Johnson Quota Act (ch. 8, 42 Stat. 5 of May 19, 1921) restricted immigration into the United States. Although intended as temporary legislation, the Act "proved in the long run the most important turning-point in American immigration policy" because it added two new features to American immigration law: numerical limits on immigration from Europe and the use of a quota system for establishing those limits. The Emergency Quota Act restricted the number of immigrants admitted from any country annually to 3% of the number of residents from that same country living in the United States as of the U.S. Census of 1910. Based on that formula, the number of new immigrants admitted fell from 805,228 in 1920 to 309,556 in 1921-22. The act meant that only people of Northern Europe who had similar cultures to that of America were likely to get in. The act, sponsored by Rep. Albert Johnson (R-Was), was passed without a recorded vote in the U.S. House of Representatives and by a vote of 78-1 in the U.S. Senate. James Alexander Reed, a Democrat from Missouri. The widespread unemployment that followed the end of World War I lent strength to the anti-immigration movement. The Act restricted the number of immigrants admitted from any country annually to 3% of the number of residents from that same country living in the United States as of the U.S. Census of 1910. The use of such a National Origins Formula continued until 1965. The average annual inflow of immigrants prior to 1921 was 175,983 from Northern and Western Europe, and 685,531 from other countries, principally Southern and Eastern Europe. In 1921, there was a drastic reduction in immigration levels from other countries, principally Southern and Eastern Europe. Professionals were to be admitted without regard to their country of origin. The Act set no limits on immigration from Latin America. The Act was soon revised by the Immigration Act of 1924. 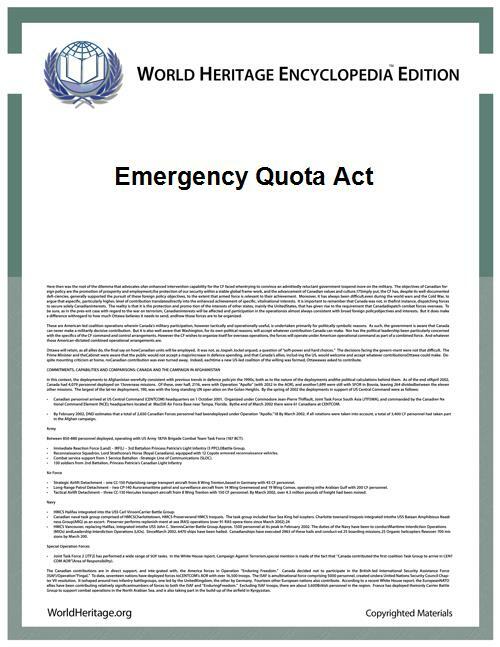 ^ "1921 Emergency Quota Act". American Catholic History Classroom. Retrieved 2012-01-05.